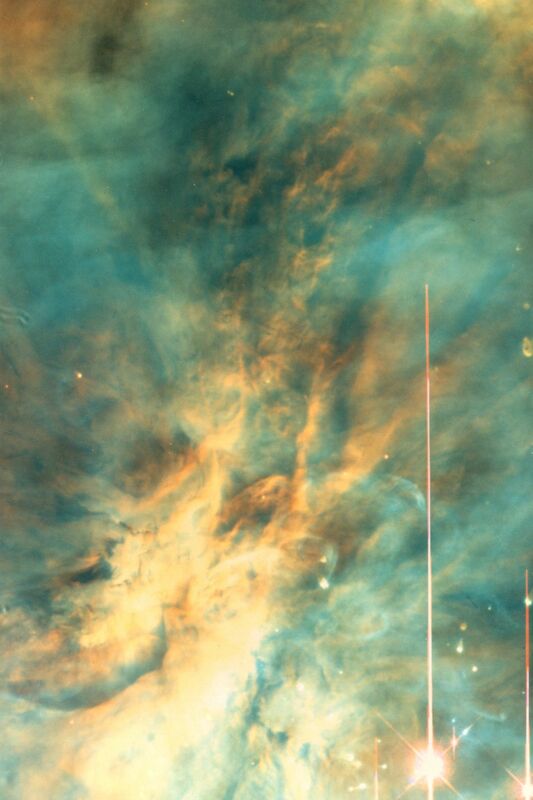 Hubble Space Telescope image of a region of the Great Nebula in Orion, as imaged by the Wide Field Planetary Camera 2. This is one of the nearest regions of very recent star formation (300,000 years ago). The nebula is a giant gas cloud illuminated by the brightest of the young hot stars on the right side of the picture. Many of the fainter young stars are surrounded by disks of dust and gas, that are slightly more than twice the diameter of the solar system (or 100 Astronomical Units in diameter). The great plume of gas in the upper left in this picture is the result of the ejection of material from a recently formed star. The diagonal length of the image is 1.6 light years. Red light depicts emission in Nitrogen, green is Hydrogen, and blue is Oxygen. The picture was obtained with the second generation Wide Field and Planetary Camera (WFPC-2), which was installed in the Hubble Space Telescope during the STS-61 Hubble Servicing Mission. The WFPC-2 includes within it optics that correct for the aberration of the telescope's primary mirror, restoring the optical quality of images obtained with the telescope to the level that the telescope was originally designed to provide.